Squash is one of the easiest vegetables to grow and one of the most satisfying. Summer squashes like Zucchini and Yellow Crookneck give us mountains of fruit all summer long and winter squashes, like Butternut and Spaghetti, allow us to store summer's harvest and enjoy a taste of the garden in the dead of winter. So much zucchini! During the summer large zucchini can be used just like small ones. They grow so quickly that they don't have time to get woody. If you cut it open and the seeds look like slits instead of seeds, it will still be soft and sweet inside. If you see rings in the flesh, then it is too old to eat. Fresh picked zucchini can be stored a day or maybe two. Once the fruit becomes at all rubbery, it is best to discard it and go pick a new one. Shredding it is one great way to use up extra fruit. We prefer to shred the zucchini using a medium grate blade on our food processor. We tried a box grater, but the zucchini was too thin and too watery. We found that the short strands that are produced from the small feeder tube on our Cuisinart work better than the long strands that come from the wide mouth. The only time we shred the zucchini in the wide tube is when we want to add it to spaghetti. Once the zucchini has been shredded, we let it drain in a deep barbecue grill basket. (Colanders just don't let enough water out). We only fill the basket half way which is about one huge squash, two medium or three or four small ones. Place the basket over the sink and mix gently with a generous sprinkling of sea salt. Fluff the zucchini with tongs or your clean hands (guess which we use!) Cover lightly with a clean tea towel and let set for about four hours. Do not press down on the shredded squash. When you go back the squash will be dry and can be used or frozen in a zippered plastic bag. Unless you want a lot of odd shapes to deal with in the freezer, flatten the bag before you freeze it. Summer squash plants make monster leaves on large bushes. 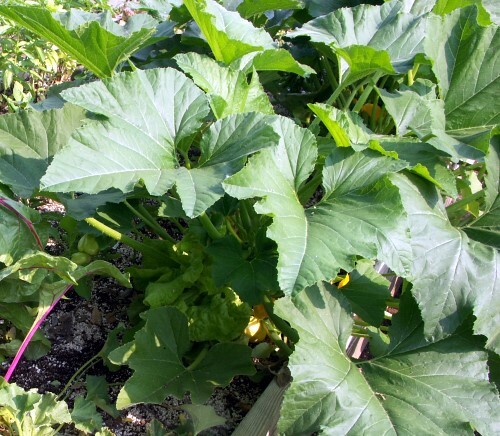 These leaves help to shade the ground conserving moisture and protecting the young squash from scalding and blanching in the sun. Zucchini is a summer squash that blooms mid season. While each plant gets quite large, it doesn't provide a lot of ripe fruits at the same time. If you have a large need, you may want to plant more than one at a time. Visit our pinterest page on squash for recipes and more tips on growing.